Phoenix Hydraulic Presses is a hydraulic press manufacturer and supplier that proudly designs and produces top of the line press solutions. Phoenix offers the widest variety of hydraulic presses by any one company. 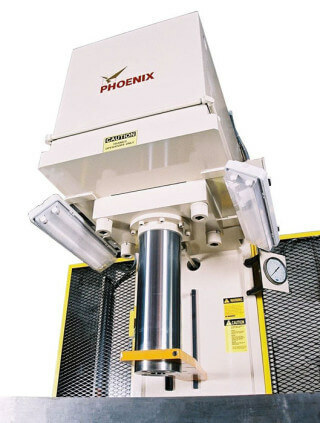 All of the hydraulic presses manufactured by Phoenix include a variety of tonnage of pressing force, and available models range from standard C- Frame presses to highly engineered hydraulic press designs. All Phoenix presses are manufactured with excellence and are designed with heavy duty construction, durable hydraulic components, and sophisticated control systems. Currently, Phoenix employs skilled individuals who continue to focus on advancing the extensive line of hydraulic presses. have exceptional experience in the hydraulic press industry. Phoenix Hydraulic Presses has a rich history of designing and manufacturing hydraulic presses dating back to 1987 when PH Hydraulics purchased a line of hydraulic presses from Shuler Manufacturing of Germany. In 2003, PH Hydraulics sold the product line to Phoenix Hydraulic Presses, Inc. a company formed by certain key employees of the PH Group. Since 2003, Phoenix has manufactured hundreds of presses for satisfied customers, and in late 2017 has been transferred to new ownership. It is now part of a larger group of companies that employ about 110 associates including over 20 engineers with experience in a wide range of fields, including the design of hydraulic presses. We are excited to announce that Jason Nolte will be leading Phoenix, bringing his 20+ years of experience in Machine Design, Manufacturing, and Project Management to the task. We are proud to carry on the tradition of quality and workmanship that are synonymous with the Phoenix name, and we look forward to providing you with solutions to all your hydraulic press needs. All-steel frame construction; electrically-welded and stress-relieved for maximum strength, rigidity, and stability. Hard tubing used where possible to reduce heat and leak points; Cylinder, pumps, and valves meet JIC standards. All circuits designed to counteract ram drift; decompression circuit engineered for smooth, shock free operation on pressure reversal or distance reversal applications. Dual ergonomic hand controls come standard on all presses to promote operator safety. Available from 2-2000 tons, engineered specifically for your unique application.